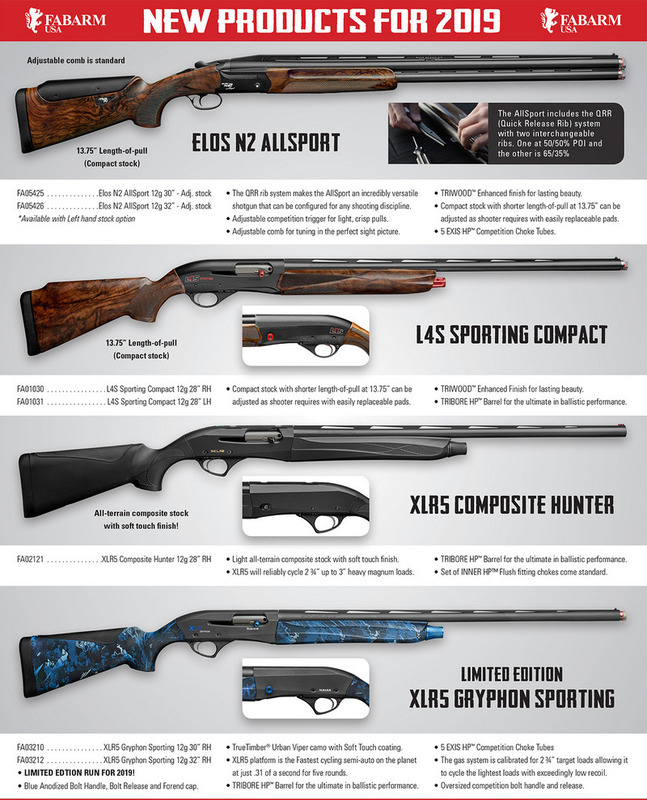 Fabarm USA announced their new models for 2019 just recently. More and more, firearm manufacturers seem to be getting away from the “annual” new models like you might expect from the automotive industry, for example. There are good reasons for this. Every year, at the SHOT Show, for example, there are so-called new models from a variety of manufacturers. Often, it turns out that the only thing new is the announcement itself, for many cannot be purchased and won't be available for purchase until nine or ten months down the road, if then. Sometimes, they never are (Ithaca Phoenix), by the time they come out they are already recalled or discontinued (Remington 105CTi, Beretta UGB25 Xcel), or sometimes the gun manufacturer itself vanishes before the guns come out. Back in 1975, a regular Browning A-5 (Grade I) sold for about $450. That's the buying power of $2105 today. As Wesley Lang has recently commented, manufacturing costs rise every year by 3-4% or so, on average. If a firearm is selling for the same price today as it was ten years ago, something had to give. It could be less finish, less quality control, less customer service, less parts inventory, less margin . . . but it is substantially less something. That is despite modern manufacturing efficiencies that require large investments in machining centers and tooling. I grew up with “regular quality guns.” Today, in some cases, regular quality has become “high grade guns” from some folks. One of the new models now offered to the American market by Fabarm USA is not a new model at all on the world stage. It is the XLR5 Composite Hunter semi-auto, now offered in basic black trim with a Fabarm soft-touch stock. It is a simple, honest 3 inch 12 gauge that is around 7 pounds, is soft-shooting, and isn't a $2500 shotgun by any means. It is an all-round shotgun, most would likely consider it a hunting gun, but a T&S hull catcher is available for the XLR5 which makes it a fun casual trap gun as well. It is light enough to hunt with, yet soft-enough shooting for volume clay and dove use. One of the concerns about some Fabarm shotguns is that they are “too pretty” if that can be considered a complaint at all. The Caesar Guerini / Syren / Fabarm pedigree in the United States has largely centered around clay target sports, as well as the overall beauty of the shotgun. One of the new releases from Caesar Guerini is the “Revenant”: a twenty gauge that aspires to bespoke gun quality and refinement without a $70,000 - $100,000 price tag. The Fabarm XLR5 Composite Hunter is not that gun. Rather, it is an all-round gun with a conventional flat ventilated rib (that takes Weaver style rings, if you wish, to add an optic for predator hunting use and so forth) that you won't be afraid to take to the goose pit or duck blind. It has a 28 inch barrel and shaves three hundred dollars or so away from the price of an XLR Waterfowler as well. For many of my readers, this will be the only 12 gauge they will ever want or need.